With the iPhone now one year old, it is come time to reflect upon it’s first year of public existence. The past year for the iPhone and, the cell phone industry has been monumental- many grounds have been broken. In fact the competitors are still trying to catch up to the very high standards Apple has set. This coming year should be interesting and will certainly foretell the future of the iPhone, and cell phones to come. Already in the lineup is the Official SDK in February- for native third party iPhone apps. Besides AT&T service (and EDGE), an official SDK is the top complaint against the iPhone. This coupled with other updates (16GB, 3G or price drop) as well as the expansion to Asia should prove for a very promising year for the iPhone and, Apple. Depending upon the sales of the iPhone after the price drop, the goal of 10 million iPhones sold should be obtainable by the end of this year. 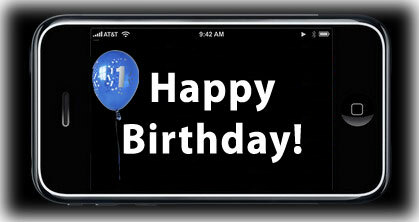 Happy (public) Birthday, iPhone- may this year prove even better!